The UK Civil Aviation Authority (CAA) has released figures that suggest a significant rise in cases of “disruptive” behavior on flights. Apparently, they have tripled over the past three years. Alcohol intake before and during flights is often to blame. 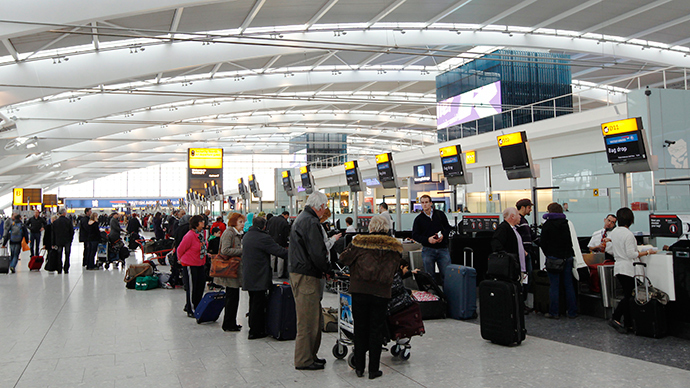 The CAA confirmed over 114 incidents of “disruptive” passengers over the past year. Alcohol consumption before and during flights is specifically identified as a “threat to safety” of passengers and crew, including the pilot. British Airways’ alcohol policy currently allows passengers to carry a maximum of 5 liters per person on board. However, disruptive incidents also include bomb threats, assaults on crew, attempts to break into the cockpit and smoking in toilets. CAA statistics suggest incidents are at their highest level in five years. Recent cases include a pilot making an emergency landing en route to Dublin, after a drunken passenger stripped naked and began to punch the walls of the aircraft. They said the drunken passenger had a “scuffle” with cabin crew shortly before they “calmed him down.” He was arrested when the plane landed. In January, another drunken passenger, who witnesses say “stunk of alcohol,” attempted to open the plane door just as it was about to land. Drink-fueled passengers have also been known to abuse staff. YouTube footage shows a drunken man screaming at an airport gate attendant. In December, London Mayor Boris Johnson was caught up in a mid-air drama when he tried to calm an inebriated passenger who became “violent” on a flight from Kuala Lumpur to London. Johnson said the man was “off his head” before he was restrained. The offender was jailed for six months. In another incident, an intoxicated passenger delivered a racist tirade against Middle Eastern people. “I have a very racist view of all Middle East [sic],” she told a Middle Eastern man while mocking his accent. A woman tweeting from the scene said the disruptive passenger, called Nadia, had been “asked to stop speaking.” Nadia was reportedly escorted from the airport once the aircraft landed, but was not arrested. Sitting behind the worst person in the world. She said "I have a very racist view of all Middle East." She's talking to a middle Eastern man, also mocking his accent. The couple in front of her are shouting at her. She's slurring "what is first class? I've never been on it." In a more serious incident in April last year, passengers feared for their lives when a drunken man caused a “hijack scare” on a plane en route to Indonesia. Staff and passengers said he “acted aggressively” before he tried to force his way into the cockpit. Once the plane landed, the man was “dragged out and arrested,” while armed officers held him at gunpoint. “It is actually a specific criminal offence to be drunk on board, and also to refuse to comply with instruction from the captain,” they added. “We welcome criminal prosecutions where appropriate,” they added. Nathan Stower, Chief Executive of the British Air Transport Association said: “Airlines set tough rules around the consumption of alcohol and can refuse to carry someone who is drunk,” in order to prevent “disruptive” behavior and ensure the safety of those on board.